The Sennheiser MKH-416 Short Shotgun Microphone is an industry standard among video, film and ENG/EFP professionals. The compact capsule features a transformerless, RF condenser designed for excellent feedback rejection, high directivity, and low proximity effect. Using phantom power (48 volts, +/- 4), this microphone is ideal for use with a boompole or mounted on a camera. Please note that a DSLR will not provide phantom power. You will need to rent an audio recording device that is XLR compatible for this microphone to work properly. Please see your options here. 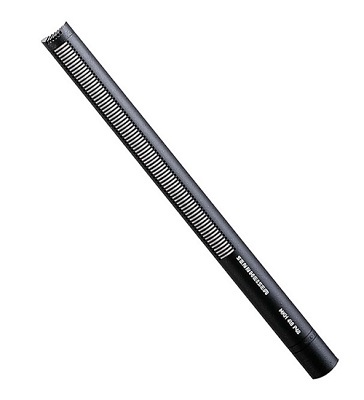 The Sennheiser MKH-416 Short Shotgun Microphone provides high-quality sound for recording to radio, broadcast television or film including exterior location shooting. • This microphone requires phantom power (48 volts, +/- 4) to operate. An audio recording device or camera that is XLR compatible is required to use this product and is not included. DSLR cameras do not provide phantom power nor XLR inputs. Plan accordingly.